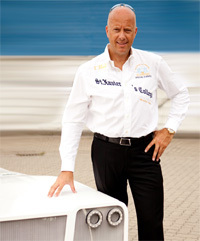 The company M-racing Fahlke KFZ-Technik und Prototypenentwicklung was founded in 1997 by the current owner Markus Fahlke. M-racing Fahlke KFZ-Technik und Prototypenentwicklung has been based in Buchholz (Nordheide) since 2002 and in Scheeßel since 2012. It is closely associated with the company Fahlke Control Systems. As a market leader in automation systems for gas and oil pipelines around the world, we have worked in metal constructions, control systems and electronics since 1975. We are therefore able to access our many years of experience in the development and construction of entire vehicles, as well as carbon-fibre components. The mechanical engineer and former aviation pilot Markus Fahlke developed and designed the spectacular Larea GT1 in just 2½ years. Through his many years of experience with racing cars, his technical background and extensive technical knowledge in aerodynamics, he was able to combine the most modern sports car genes with absolute suitability for everyday use, thus creating the hyper sports car, the Larea GT1. The essence of the most modern materials such as carbon, high-tech steels, an absolutely warp-resistant body and an engine that provides a previously unachieved horsepower-weight ratio make the Larea GT1 an absolute gem for winners. The Larea GT1 is a bespoke car produced in a limited number especially for the exclusive circle of its owners.